Dying hair is all fun, although it is still not an easy task to convince mothers to allow, for many of us. 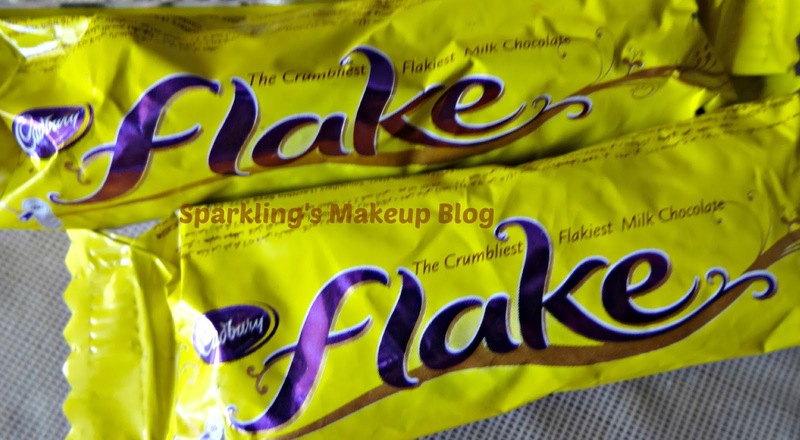 I have had all those discussions when I was young and un-married, now I am married and have few grey hairs too, so didn't have to put much effort to fulfill my desire of having Chocolate for my Hair. Am I impressed with Garnier Color Naturals Brownie chocolate performance? To Reveal read More!!! 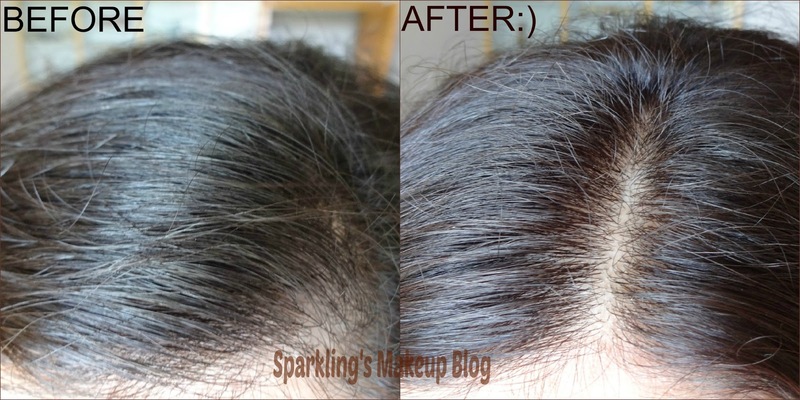 Nourishing permanent color cream with Olive Oil. The packaging is really attractive, it has a full essential kit inside, sans the brush and bowl. The kit include one developer milk, one hair color cream, one After Dye Mask with Olive Oil, one step by step guide and a pair of disposable gloves. 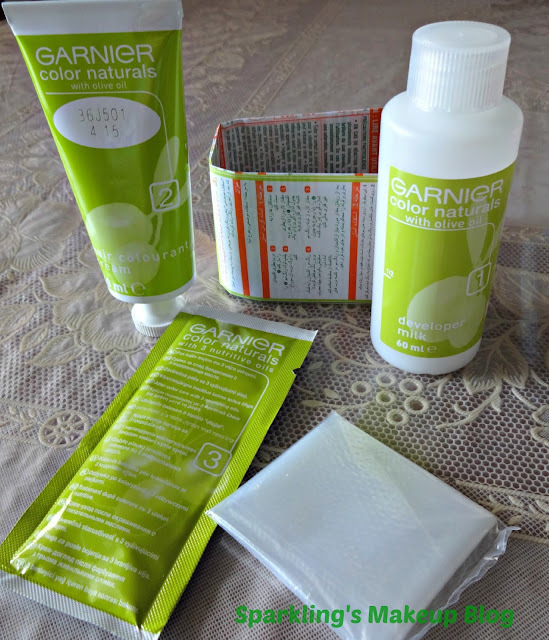 As the tinting brush is not part of the kit I bought it separately, I so wanted to have Garnier's green one but it was out of stock at the store so got the black one from Rivaj UK.Soon will buy brush and bowl of Garnier. I love Green! Like many of girls Hair-dyeing and hair colouring has always fancied me. After my University, and after a long discussion with my mom I once had streaking and once I had full hair dye, with cut down and highlights on the crown area, from a hair salon. So this is not the first time I had a Hair dye, but yes it was the first time I had it on my own. 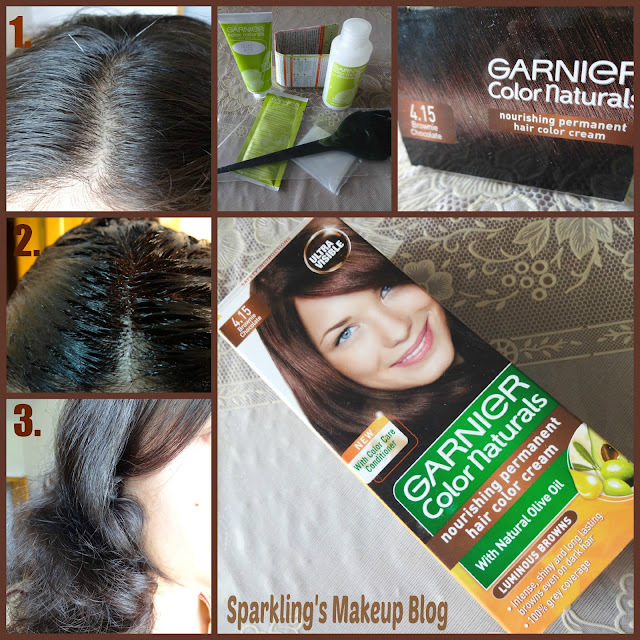 Garnier Colour Naturals is not new to me either, I used it to dye my Mom's hair few months back, the complete experience is shared HERE!!!. I have always had a white/grey hair in my front puff since childhood, I kinda liked it always,it was not permanent some times it comes, grow, break and then gone forever, then sprout again. 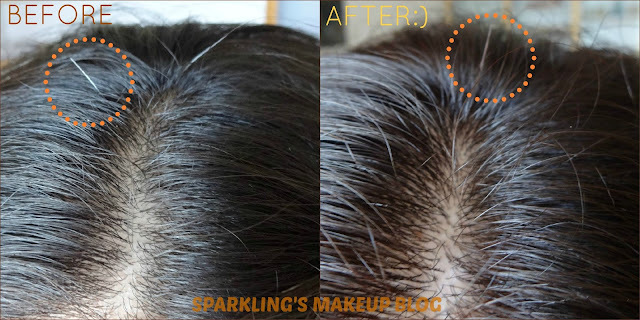 Now grey hair are more obvious I have approx 7-9 of them, well still countable (means situation under control:p). On Eid I wanted to dye my hair but was a little bit skeptical for the result, may be the shade won't suite or will be loud etc,so I cut all my 7-9 grey hair, I know that's silly. Once back for Eid festivities and activities, I had Hair-dye on my top priority list. As I told earlier this was my First Time to apply the dye on myself, but I was not nervous at all, as I trust Garnier and my skills:p Few things are to be taken care of before, between and after hair-dye time. So let's start with the 3 steps one be one. Before hand preparations are very important, do take care of these all. Once you are ready, let the show begin with fun! NOTE: I have described every thing in details to my best knowledge BUT DO READ ALL THE INSTRUCTIONS YOURSELF. If this is also your first time, have some one to assist you by you side, esp for the back hair and cleaning ears etc. If you have no idea how to dye, I will recommend to take your Garnier Colour Naturals and ask a beauty-parlor/hair-salon girl to do it for you, that's easy as she will wash your hair and take care of all. After Dye process is completed you can take few measures to prevent damages etc. Do not blow dry, let the hair dry naturally, your hair have been treated with dye so be nice to them, this will surely lessen the risk of damage etc. 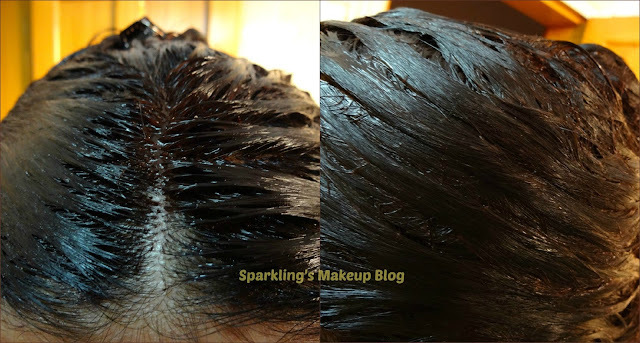 When I had Hair-dye from Hair Salon, they usually use blow dry to style your hair soon after the dye is rinsed-off, that cause more hair fall and damage. Most Important: HAVE FUN WITH YOUR NEW HAIR COLOUR....TAKE CARE! I must tell you that I was not expecting much as I have dark brown hair. But I am impressed with the results. My hair are now more shinier and yes they have a subtle chocolate tint, and the grey hair gone:) Got a chocolate shade for my hair without any cut down (bleaching of hair). Trust me the dye has improved the texture of my hair also. 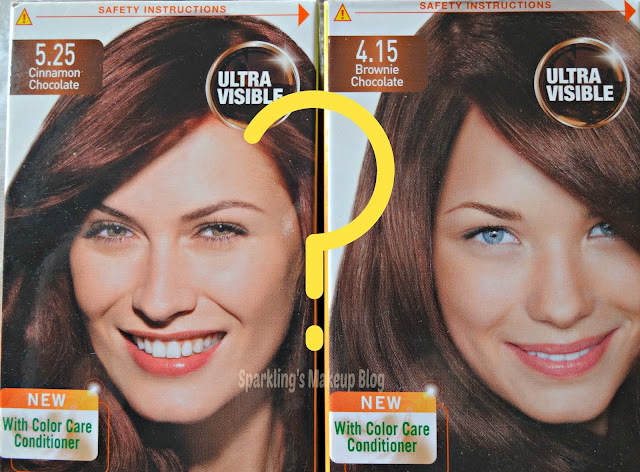 In the third picture you can see that grey, cut-short, hair, two are obvious in the "before" picture and in the"after" they both are tinted, it is only shining due to Sun-light. Now chocolate treat for my tummy, Yummy!!! 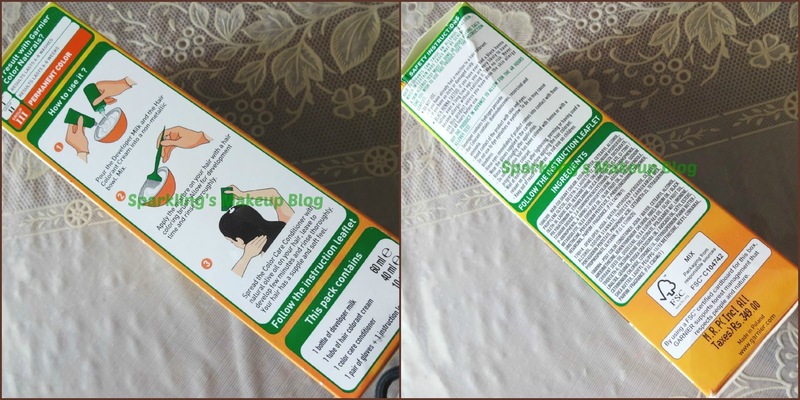 The price mentioned on the pack is Pkr 349/-. Easily available nation wide. 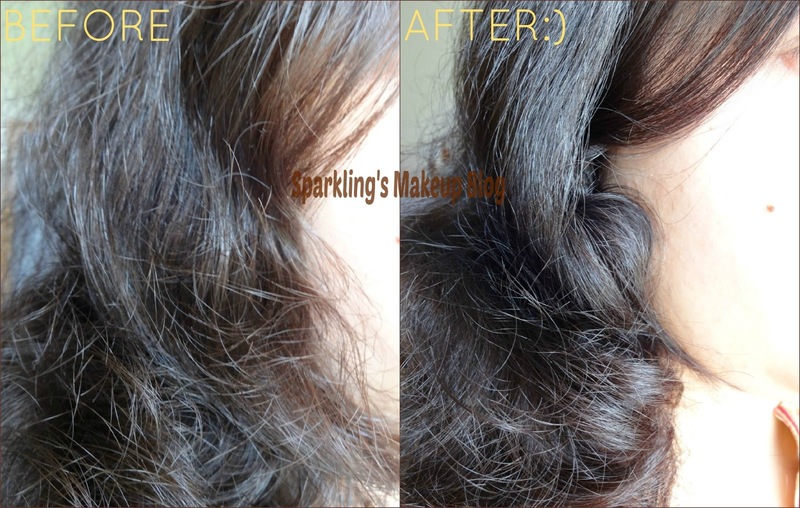 for further details and new offers check Facebook page of Garnier Pakistan. Do read other Sparkling Posts on Garnier. Hope you like this Hair Dye at Home post. Do share your views, comment, share, like, tweet, G+ and Pin IT. Bless me with your comments!!! How you liked my new Hair Colour? 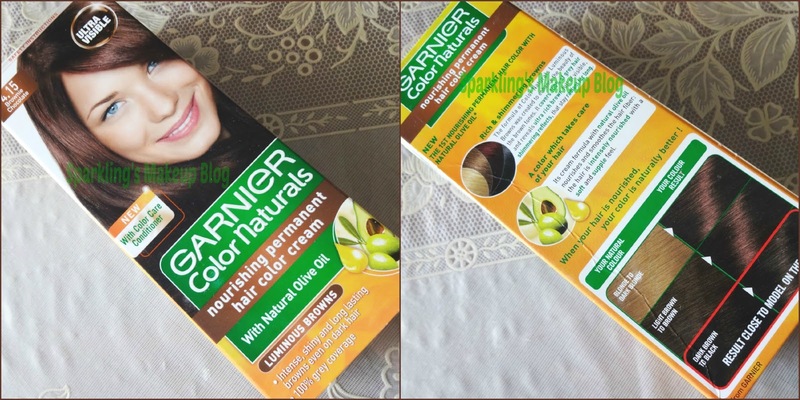 Have you tried any of Garnier's new Nourishing Chocolate Collection yet??? Do share your experience.